The vicar has had a brilliant idea this year and thought it would be wonderful to involve St. Hilary's Church in the national "Heritage Weekend" event held in the United Kingdom from Thursday 10th - Sunday 13th September 2009. He asked the children to come to church after school on the Wednesday of that week so he could chat to them all about it and explain what he would like them to do to support him during the long weekend itself. 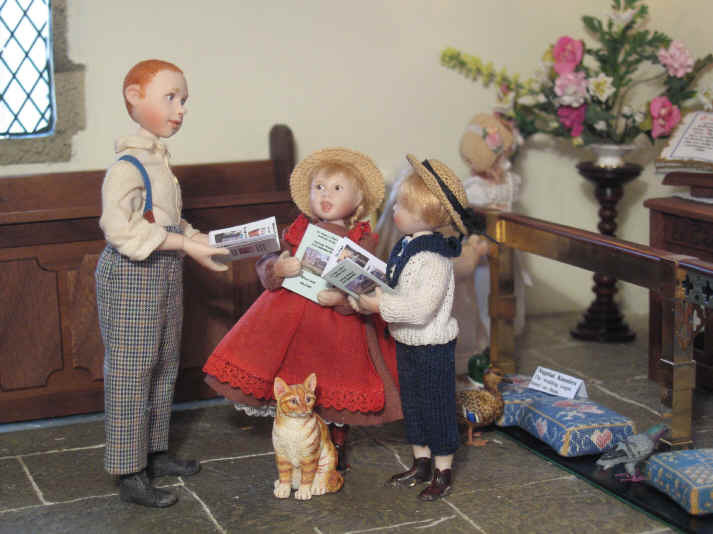 The vicar has gathered the children in the pews because he wants to chat to them about the idea of "heritage" and what it means to people and themselves in particular. Can you see the notices on the pulpit? 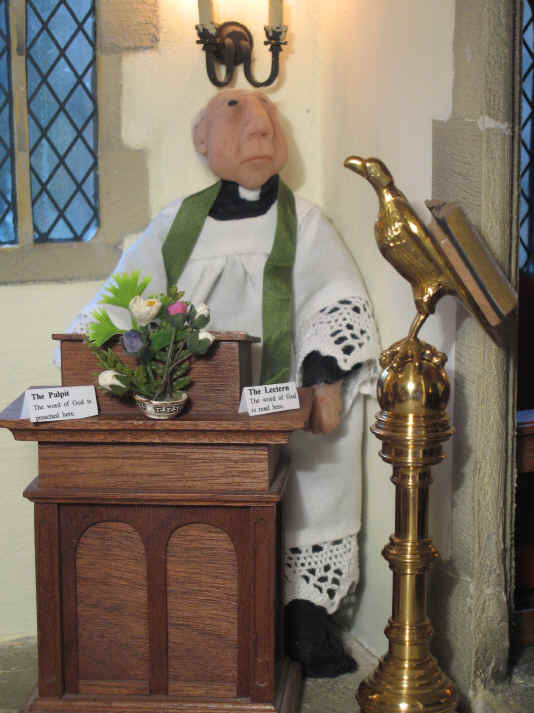 The vicar has made notices for all the major pieces of furniture in the church so that visitors who are not familiar with churches will know what each piece is called and what it is used for. The vicar has brought along a wall plate with a painted flower on it. He explains that it is very special to him because his mother bought it many many years ago in an antique fair in Australia. When she died she let him keep it. He explains to the children that it is very important to him because it represents his mother to him now she is dead and also because it is a beautiful piece of art work too. He plans to let his daughter have it when he too has died so that she can treasure it and let her children have it so they can pass it down to theirs too when they grow up. Ambrose was asked to bring something VERY special to church to show the children today by the vicar. 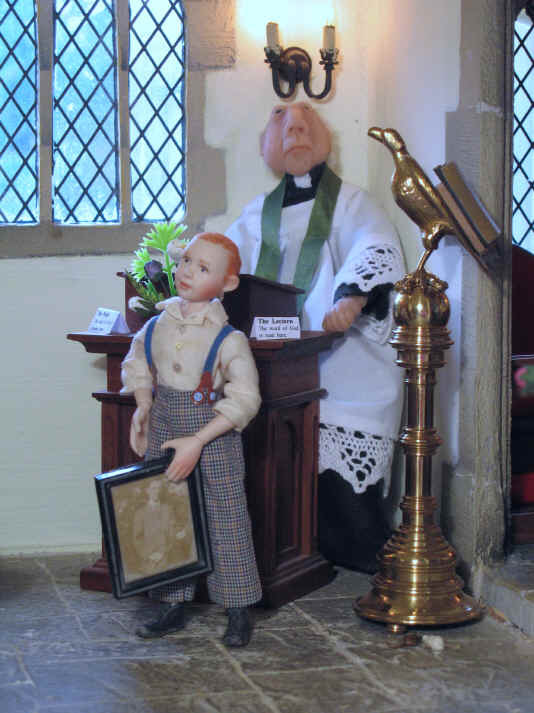 This photo is even older than the painted Australian wall plate that the vicar has just shown the children. This is a treasured family photograph of Ambrose's great great grandfather when he was presented with a ceremonial ebony and silver baton by his choir in Wales. You see, Ambrose' family originate from Wales and he comes from a very musical background. His great great grandfather was a very good conductor of his choir and they wanted to thank him for his work with them. They clubbed together and bought him this wonderful baton you can see him holding here. Ambrose told the children that he was given it by his father who was given it by HIS father before he died. 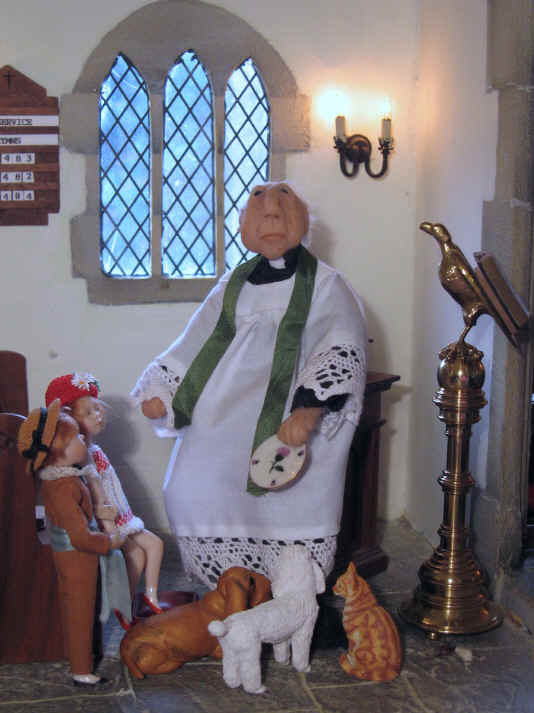 The vicar explained to the children that this photograph was part of Ambrose "Heritage" and would form part of Ambrose's family memories as generation succeeds generation. In the same way, the vicar explained, the painted plate his mother let him have before she died forms part of his family's heritage and will join other treasured possessions and photographs which will be passed down from generation to generation. The children were then asked by the vicar to think of things that they have in their family home that form part of THEIR family's heritage. 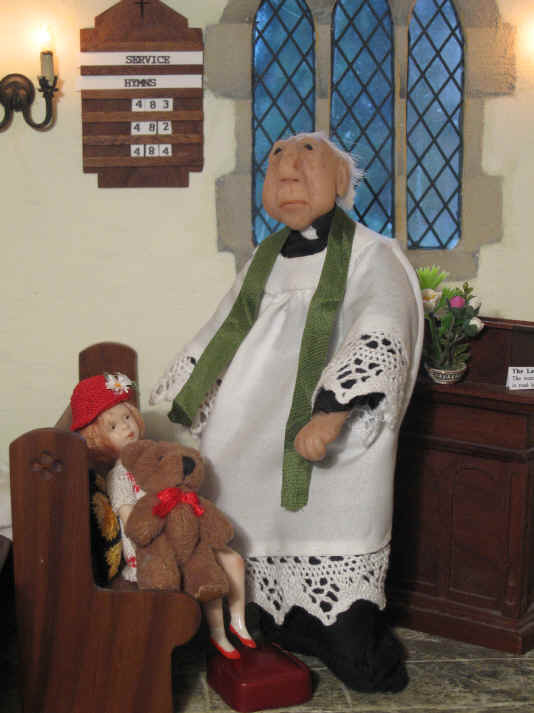 Poppy was quick to ask the vicar if the teddy bear she brings to church for company and comfort is part of her family's heritage. She told him how the teddy bear was bought for her when she was a tiny baby and she wants to keep him for ever even when she grows up because she loves him so much. The vicar assured her that the bear is part of her heritage because he is special to her. And so.................the vicar explained that the "Heritage Weekend" was both a celebration of the heritage that the United Kingdom has inherited from their ancestors in terms of historic and special old buildings but also an annual opportunity for any member of the general public to go and visit one for free that is open as part of the Heritage Weekend project. The vicar told the children that they had an even more special heritage......and this was the Christian faith. This faith was born when Jesus Christ died to save our sins on the cross. If Jesus had not died the Christian church would NEVER have been born and all these wonderful old churches that are now part of our heritage would never have been built. The vicar is awake bright and early on Thursday morning and you can see he has brought a bill board to advertise the Heritage Weekend to all people who visit the church. 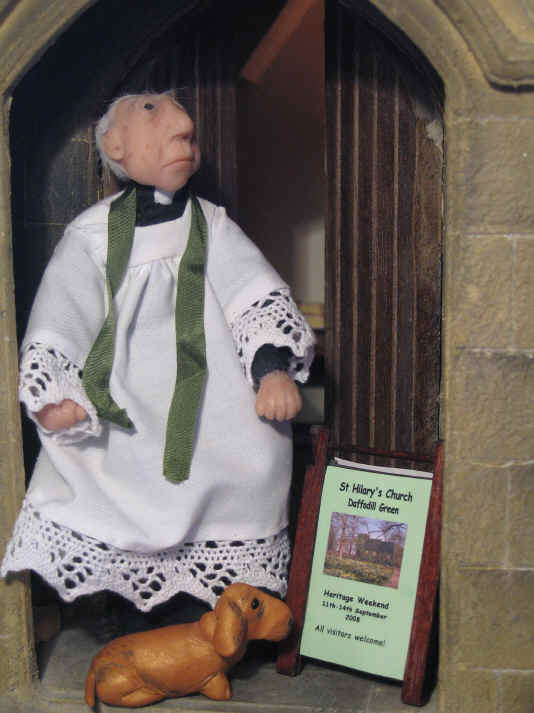 Even Bardsley, the bishop's pet dog, the vicar is looking after, is impressed with the bill board notice the vicar has created. Oh dear...........can you see that one of the Christmas photos looks a bit wonky? Poor Adele didn't quite get that straight did she........but the vicar won't mind we are sure because she has put SO much effort into this photo album. Can you guess WHO took some of these photos...........Tom of course! He was asked to take the photos used in the Heritage Weekend guide which has been printed. He is SO proud because he was able to use his grandfather's camera. He now realises that his camera is part of his family heritage as it belonged to his grandfather. That is why he is now even MORE careful to look after it so that he can give it to his children when he grows up. Oooooooh..........looks even better here now! 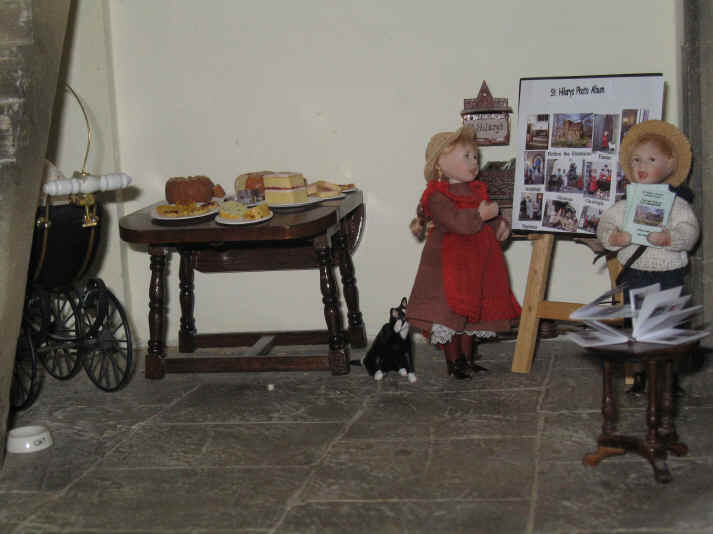 The vicar wanted the Heritage Weekend to be really successful so he was determined to make visitors feel welcome during the weekend. 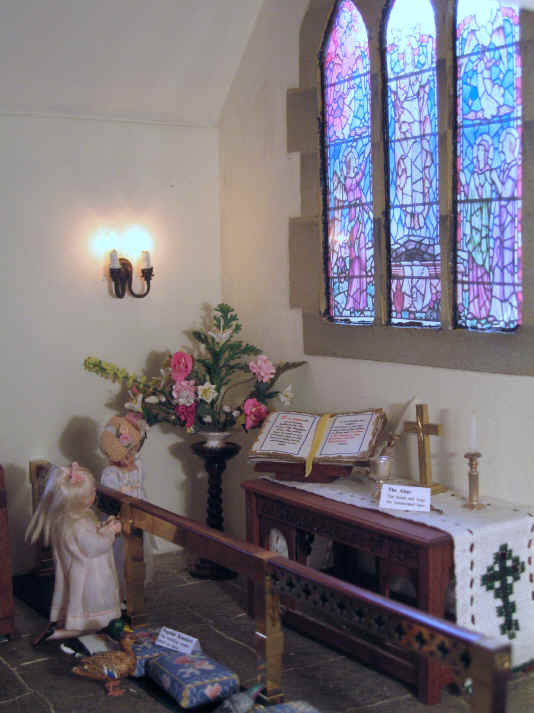 He therefore asked people to bring cakes to church so that visitors can be offered tea or coffee and cake after they have looked around the church. We think that the congregation have done the vicar proud with this wonderful display of cakes. Alice and Ambrose will so enjoy serving up teas and coffees to the visitors during the weekend. 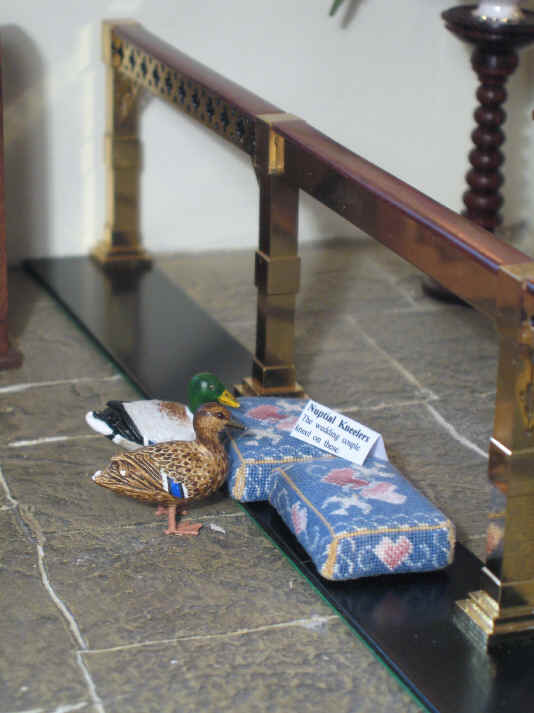 Esme and Ernest the local pair of Mallard ducks are reminiscing as they gaze on the two nuptial kneelers that the vicar has put out specially for the Heritage Weekend. These normally are only seen when there is a wedding at the church. The kneelers remind them of the time they decided to commit their lives to each other and make their home on the local village duck pond where they have raised many babies over the years. What is going on here? 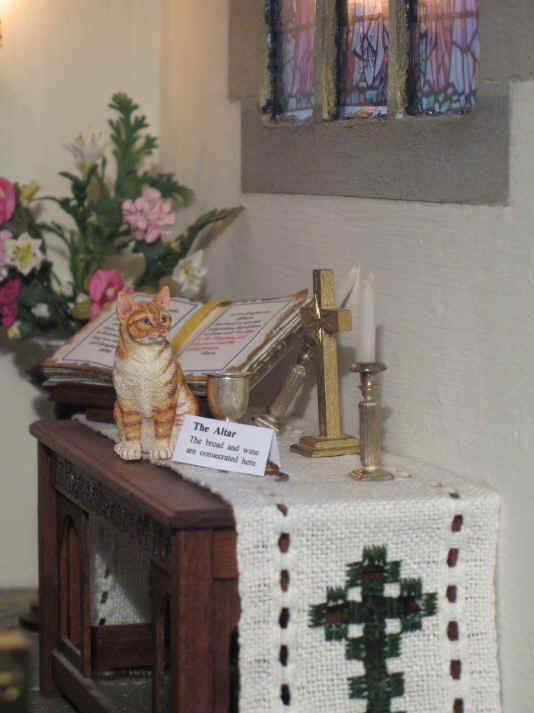 Looks like Magnifi-Cat, the church cat, and Nunc Dimittis, the church mouse, have decided to have a game of "cat and mouse"......but surely NOT on the altar? And WHO has managed to knock the candle stick down as they have been chasing each each other......the vicar will NOT be pleased will he? Nunc Dimittis is plainly having fun hiding from Magnifi-Cat the church cat. Umm...........do you think Magnifi-Cat will spot where he is? 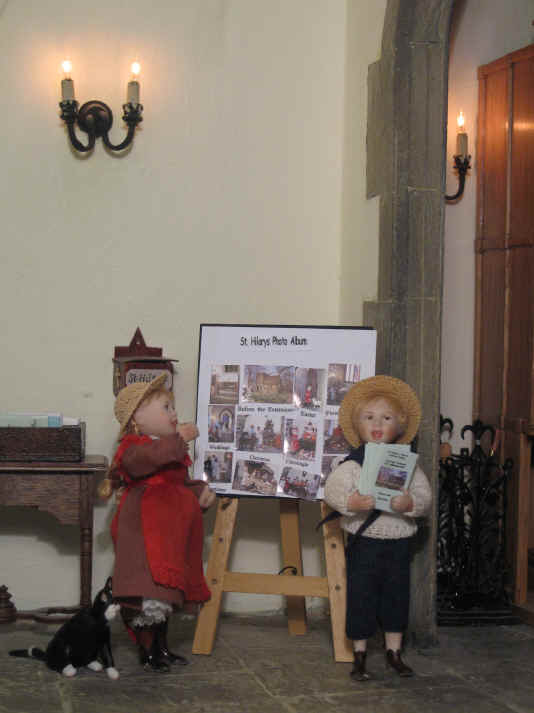 Tom has let Ambrose have a preview of St. Hilary's Church Heritage Weekend Guide. He is MOST impressed with the photos that Tom took! Adele too is very interested to see how hard Tom has worked at his photography. Priscilla Jane and Megan always enjoy spending a few quiet moments looking at the altar and sanctuary and admiring how beautiful it always looks! Shame that they haven't noticed that Magnifi-Cat has knocked over that candlestick and that Nunc Dimittis is STILL in hiding from a now disinterested Magnifi-Cat. We hope they notice in time! 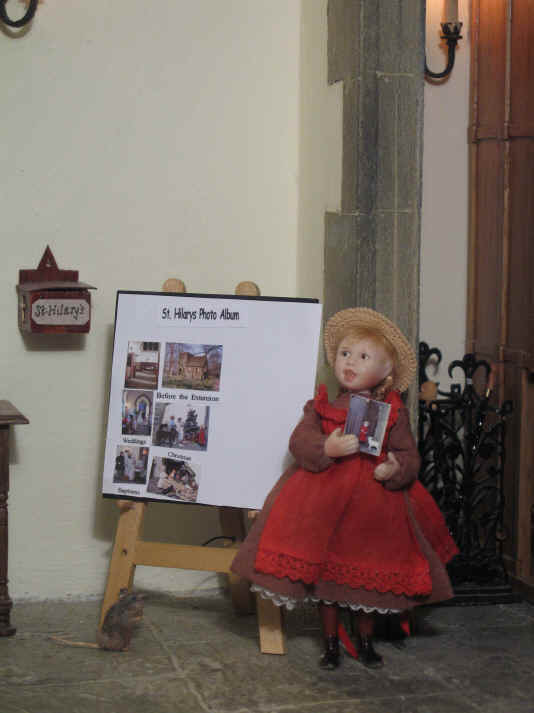 Megan and Priscilla Jane already KNOW that the Heritage Weekend will go really well in St. Hilary's this year! National Heritage Weekends are held every year within the United Kingdom. Visit their website http://www.heritageopendays.org.uk/ and find out more!